Colombo used to be described as the ‘Clapham Junction of the East’. By virtue of its strategic position on the route between the occident and the orient, Sri Lanka absorbed foreign influences like a sponge. And improved them and adapted them to the indigenous culture. Thus we have Baila music, from Portuguese Africa and Paraguay (of all places) and our splendid theatrical and operatic tradition, deriving from Parsee semi-operatic theatre and Portuguese Catholic devotional music as well as from indigenous Tamil folk drama and Sinhala religious rituals. Even our apparel is similarly multi-national. Our National Dress is basically a Keralite sarong combined with a North Indian Kurta (over a Turkish banyan) for men or an Indian saree (indigenised as ‘osariya’) and a Portuguese jacket for women. Even the ‘nilame’ kit which is popular as wedding attire is derived from Dutch tricorne hat and Portuguese jacket and shoes - the dhoti being the only indigenous item. This brilliant melange is apparent in the island’s cuisine. Foreign victuals were adapted to the local palate and made spicier, becoming part and parcel of our food culture. The traditional indigenous boiled rice is supplemented by curries influenced by Kerala, Tamil Nadu and the Malay Archipelago; spiced with traditional ‘thuna-paha’ curry powder (a base of cardamom, cinnamon and cloves plus coriander, cumin or fennel), with a lot of turmeric and (Portuguese-introduced South American) chilli added. Other dishes point to the diversity of our modern culinary culture: hoppers and string-hoppers from Kerala, Dutch-Indonesian lomprijst (‘lump-rais’) from, buriani from North India, fried rice from China, malu-bistek (‘fish beefsteak’), ‘katalis’ (fish cutlets) and ‘pattis’ (patties) from England. Sharing these global origins is our range of sweetmeats and desserts: traditional kavum is supplemented by kokis from Holland, aggala from India, aluwa from Arabia, Indo-Portuguese bibikkan, and from the Malay Archipelago, sago pudding, kalu-dodol and the incomparable watalappam. 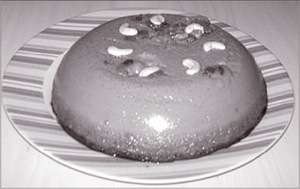 Unfortunately, it is difficult nowadays to get one’s hands on good watalappam. Whereas buriyani, washed down with a cool sherbet, was only complete with a goodly portion of the ambrosial dish for afters, nowadays it is replaced by caramel pudding or some such relatively insipid dessert (the sherbet, too has been displaced by cola drinks). Watalappam in even more difficult to find ready-made in shops, where its place has been usurped by a ghastly, ultra-sweet and barely edible concoction called ‘chocolate biscuit pudding’ - sold in plastic packs similar to those in which the divine dessert is delivered. Even when it can be located, the watalappam is of inferior quality. For economy’s sake, the traditional ingredients are substituted for - sugar for jaggery, condensed milk for coconut milk and inappropriate artificial flavouring for spices. The result is barely distinguishable from chocolate biscuit pudding. It is not just watalappam - kaludodol and muscat have been similarly degraded with synthetic essences and improper ingredients. Ditto, fried rice (too much monosodium glutamate), hoppers (too much yeast and chunam), and even red rice string hoppers (too much cochineal colouring). The decline of watalappam is a symptom of a malaise which has gripped our society - a general cheapening of values, a substitution of ‘inappropriate ingredients’ in what was a rich and elevated culture which had previously had the best of every foreign influence. Consider architecture. Many an old and venerable building, overflowing with architectural merit and built with traditional craftsmanship allied with Portuguese and Dutch styles, has been torn down and replaced by some concrete and glass monstrosity with faux-traditional pillars and balustrades. The light and easy designs of older Buddhist monasteries have given way to heavy and overly decorated structures. Where earlier the images of the Buddha exuded decorum, located amidst frescoes in natural tints, nowadays they are a riot of colour set in an even greater dissonance of synthetic paint, befitting a Hindi movie set. Go to a wedding and one is beset by food too sweet, music too loud, costumes too bright and hair styles too teledrama-esque. And the less said the better about those cheap and tawdry tele-melodramas; unworthy successors to the dramatic opera of Ediriweera Sarachchandra, to the filmography of Lester James Peiris, DB Nihalsinghe and Vasantha Obeysekera. The intellectual flowering of the post-independence era was a celebration of ‘Thuppahi’ culture, in the best possible sense - a celebration of, simultaneously, diversity and the indigenous. Ours was to be a beacon for a new, multi-faceted, global culture. Unfortunately, today we are reduced to the lowest common denominator of a globalised, synthetic, ‘McWorld’ culture, ostentatiously ‘Thuppahi’ in the worst sense. We need to take stock of our cultural policy, which is obviously failing in the face of the onslaught of consumerist values. We need say ‘no’ to the cheap, the tasteless and the mundane. We must recreate in the 21st century what the 20th century greats did for architecture, art, dance, music, drama and literature. We need more people like Chef Pabilis Silva to demonstrate the possibility of overcoming a crass market culture and adding the flavour to our lives. It is time to reclaim our roots and to begin the climb back up to the cultural heights, from chocolate biscuit pudding to authentic watalappam.